Award-winning advertising agency Caldwell & Kerr recently added another accolade to its growing list of industry honors after being named the Top Automotive Marketing Agency for 2016. A Full Service TraDigital Agency – Caldwell & Kerr is the parent company of five different automotive-specific agencies that work together to serve all of your needs ‚Äì from in-house production to online marketing services. We‚Äôre poised and ready to handle your tier-2 or tier-3 business‚Äì and deliver big results! Home of the Original TraDigital Agency & the #1 automotive advertising agency: Moore & Scarry Advertising,¬† the award-winning social media platform Sparq, DyGen, Email Resultz and Wholesale Mail. In 2016, more than 52% of searches for automotive-related keywords originated from mobile devices and smartphones. To capture new vehicle buyers and generate sales in our mobile-connected world, having a strong online marketing presence is one of the most important investments for your automotive business. We’ve looked at automotive marketing agencies across North America to find marketing providers with a focus on automotive that provide services you can count on. 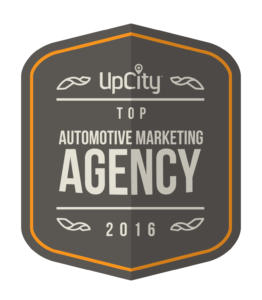 Check out our list of automotive marketing agencies below!